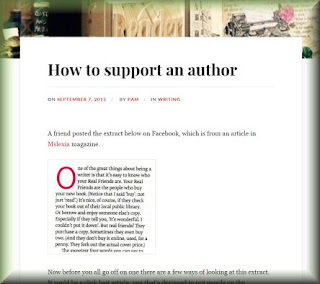 I read an interesting post on Pamreader yesterday: is supporting an author just about buying books? No, it's not. That's just one of many ways in which we show appreciation to the authors we enjoy. To add my personal spin: a single sale means very little financially - I would need many thousands to break even on a novel - though the sale means something significant to me emotionally, since someone has been interested enough in my writing to spend money on it. Book sales certainly aren't the whole story though. A single favourable review or comment means loads. My days are always brightened when someone says something nice about my books or writing. At present that’s one of my key rewards: connecting with people. That’s why I happily give away my books (often print copies) because finding readers who enjoy your work is why writers press fingers to keyboards. So thanks to all fans of writers and book bloggers who say nice things and make it all worthwhile. I can’t emphasize how important that is. Evidence Of Being A Writer - What I Do! "Look At The Size Of That Thing!" Book Sizes.